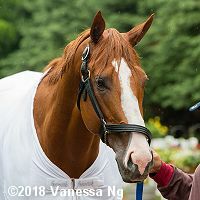 Justify after his bath on Thursday. 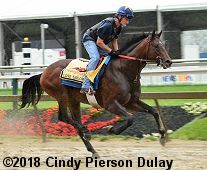 Thursday morning the track was sloppy and the rain poured down as seven of the eight the Preakness horses came out on the track this morning between 5:30 and 8:30am. Sporting Chance just walked the shedrow today. 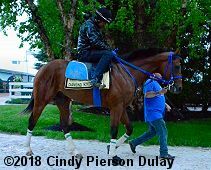 The rain fell all morning, with only a few lighter spells like when Justify went out, and temperatures were in the upper 60's or low 70's. 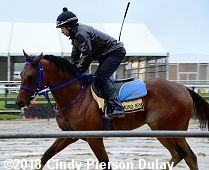 2018 Preakness Entries - A field of 8 headed by Justify in post 7 at odds of 1-2 will start on Saturday. 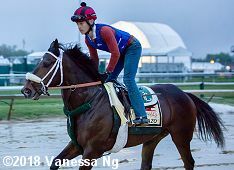 Preakness Weather Forecasts - Looks like rain, rain, and more rain. 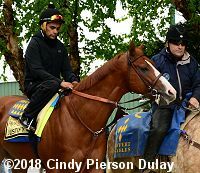 Justify - was lucky to catch a break in the rain for his gallop at 8:30am. Good Magic - galloped in probably the worst rain of the day at 7:30am. 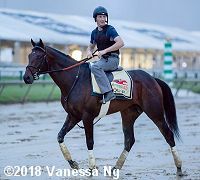 Bravazo - was out at 5:30am for trainer D. Wayne Lukas. Diamond King - came out just after 6am and went around twice the wrong direction. 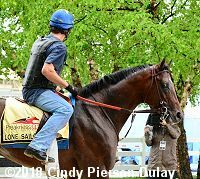 Lone Sailor - was out just after 6:30am, went around once the wrong way then turned and galloped. Quip - went out in the dark at 5:30am with with trainer Rodolphe Brisset aboard and afterwards had a bath in the rain Brisset holding him. Tenfold - also went out in the dark at 5:30am.